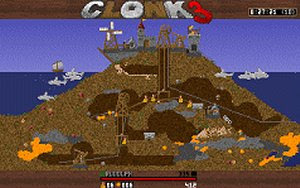 Clonk 3 surpassed its predecessors in terms of complexity and gameplay by a wide margin. Clonks could be controlled individually or in groups. They could swim, dive, dig in 7 directions and build bridges in 5 directions. Vertical scrolling enabled bigger levels that contained layers of rock, granite, gold, oil, water and acid. Natural disasters like earthquakes, volcanos and comets threatened the Clonks. Castles, lifts, windmills, pumps, watchtowers and oil-powered generators could be built with construction kits and interconnected with power lines and pipes. Available vehicles and heavy weapons included tippers, sailing boats, hot-air balloons, catapults and crossbows. Portable weapons and building materials included flintstones, incendiary bombs, arrows, concrete and steel bars. Sharks, wipfs, zaps and monsters inhabited the environment, which had a customizable climate including seasons, rain, snow, storms and lightning. Gameplay modes included learning missions, single-player/cooperative and melee/tournament. The player roster with player portraits, lots of statistics and the players' Clonk crew with their ranks and abilities was updated after every gaming session.